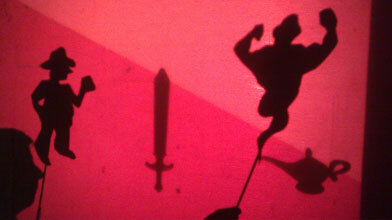 Language acquisition: intermediate Arabic students tell stories with shadow puppets. Steps 1: brainstorm characters and plots with available vocabulary 2: write individual treatments 3: meld into common story, refine expressions 4: construct specific puppets 5: run draft story, select music, sounds, settings 6: refine story, finalize & memorize script, choreograph puppet play 7: perform These steps were executed over 6 days of a workshop at San Francisco State University May 2012. Small group work helped to consolidate language learning around Thousand & One Nights text. Participants seemed delighted to construct their own meaning and see evidence of hard-won communication proficiency. Play was called "Booba Gets a Bride".